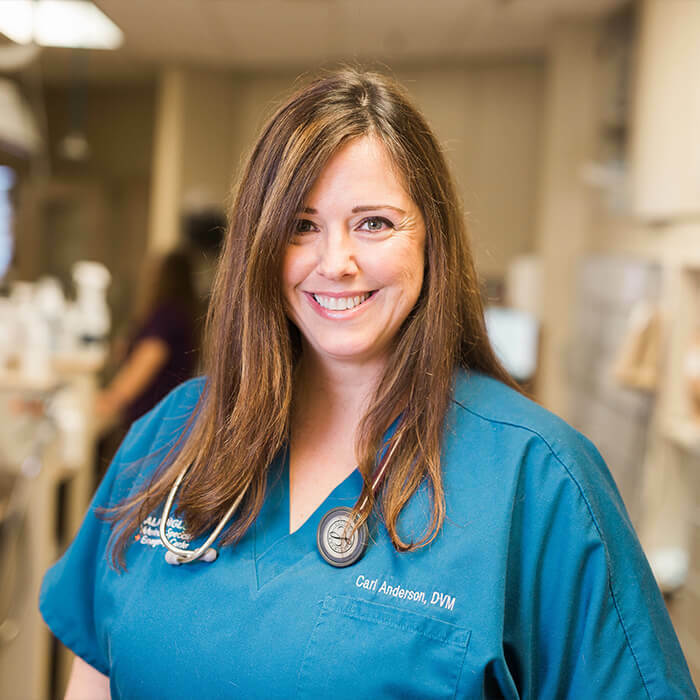 Carolyn “Cari” Anderson, DVM, grew up in Ft. Lauderdale, Florida, and lived in Florida for most of her life. She attended the University of Florida and graduated with a Bachelor of Science Degree in advertising. After working briefly in the field, she decided to pursue her dream of becoming a veterinarian. She earned her Doctor of Veterinary Medicine degree from the University of Florida in 2003 and went on to complete a small animal medicine and surgery internship at The Animal Medical Center in Manhattan, New York. During this rigorous internship, she rotated through all of the disciplines of veterinary medicine and surgery, and discovered a love of emergency medicine and critical care. After completing the internship, Dr. Anderson worked as an emergency clinician and even spent some time in general practice before moving to Colorado and joining the 24/7 emergency team at Aspen Meadow Veterinary Specialists’ Boulder location.